April 2, 2014, 7:58 a.m. The new product from The New York Times is the most interesting app produced by a traditional American news outlet in years. But can it differentiate itself from the Times’ main app — and find a paying audience? By Joshua Benton @jbenton April 2, 2014, 7:58 a.m. 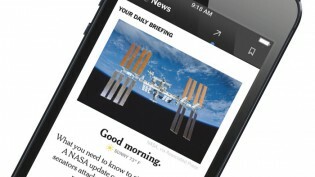 If you’ve got an iPhone or an iPod touch, NYT Now is out now and a free download. The new app from The New York Times promises to offer a subset of the Times’ content to a mobile-focused audience that gets its news on the go and wants a lower price point. 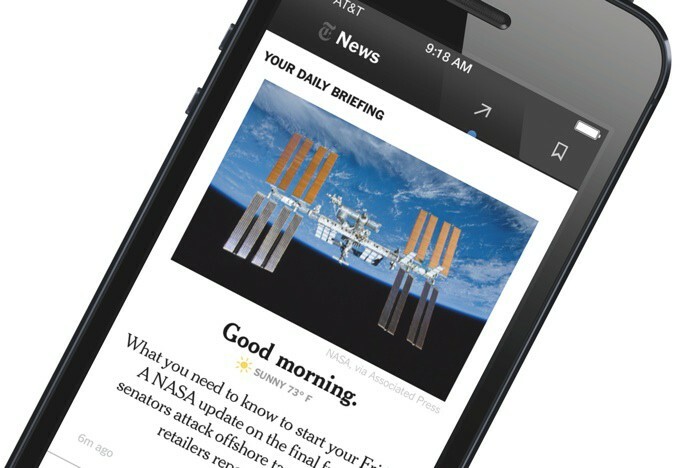 It’s the most interesting mobile app from a traditional news company in years. Ken Doctor ran through the business implications of NYT Now for us last week, but now that I’ve gotten a chance to play around with it, I wanted to throw in my two cents on the ideas behind it — the design, the user experience, and the ways in which it strays from (and remains tied to) the Times’ other digital properties. Nota bene: This is Day One, of course — anything here could change or look different in the light of further use. The story selection looks very similar to NYTimes.com. If you were hoping for a radically different presentation of individual Times stories in this mobile-optimized context, you’re not getting it. And if you were hoping that NYT Now would rethink the idea of a digital front page — pulling together different bundles of Times content for a different target audience — that doesn’t look to be in the cards, either. At this writing, the top eight Times stories in NYT Now are the same top eight stories on the desktop version of NYTimes.com. The headlines are identical or very nearly identical to the ones appearing on the web. (Headline in NYT Now: “Obama Claims Victory in Push for Health Insurance.” Headline on the story page on NYTimes.com: “Obama Claims Victory in Push for Insurance.”) NYT Now stories do seem to use different lead art in a healthy number of cases, often elevating a photo that appears lower in the story on desktop to top billing in the app. But it’s pretty darned similar. There’s a layer of mobile optimization for Times stories. An effort by President Mahmoud Abbas of the Palestinian Authority to join 15 international agencies threatened to derail the Mideast peace talks as a planned visit by Secretary of State John Kerry on Wednesday was canceled. President Mahmoud Abbas of the Palestinian Authority signs papers to join 15 international agencies. Secretary of State John Kerry responds by canceling a trip to the region. After a wave of violence in the Afghan capital, several restaurants and guesthouses popular with foreigners were ordered closed until after elections on Saturday. The government orders more than a dozen restaurants and guesthouses closed until after elections Saturday. Foreigners have been victims of a wave of violence in the capital. Minor changes, oriented around chunking up the content. Sentences are shorter, more declarative, and bulleted from scannability. I like it, but it only goes so far. The taglines attached to stories seem to have a little more voice than you might expect from the Times. This Charles Keating obit, for instance, earns a “BANKING SCOUNDREL” tag, which is rather on-the-nose. And smaller stories sometimes get a different treatment in the stream, with a nice simple sentence rather than a formal newspaper headline. But the biggest consistency is that stories appear in fundamentally unchanged form across all these platforms. This very fine Middle East story is the same 29 paragraphs and 1,437 words whether you’re at your desk or scrolling through NYT Now. That’s about 40 inches, if you still think in newsprint, and it’s pretty long for a phone. I hope in the coming months we’ll see experimentation in summarizing, bulleting, or just plain shortening Times stories in the app — offering the full article if desired, but also giving something that lies between a headline/summary and the full experience. The aggregation/curation is well done. In all, it’s a nice mix of newsy and feature-y, and the link text is freeform. It feels a bit like a news nerd’s Tumblr, and it’s an interesting contrast to the more straight-arrow collection of the Times’ own content. I hope that NYT Now editors bring a little bit more of that Our Picks DNA one tab over to the Times stories and let their presentation (and content mix) loosen up a bit. It’s not always clear what’s been updated. I don’t just mean within a story — also within the mix of stories. Our Picks is in reverse chronological order, freshest stuff at the top, so it’s easy to see what’s new. But the Times stories are positioned in an editorially derived order, laid out like a front page with only one dimension, up and down. That means sometimes new stories are added to the mix several screens down into the stream. You see a blue dot that indicates “New Stuff!,” but once you go to find out what’s new, you have to scroll and look around for a bit to find out the new story’s down in the sixth position in the stream. It’s awkward. Can it attract a new paying audience? There’s an awful lot to like about NYT Now. There are a number of elements that the core Times iPhone app would benefit from stealing: embracing the long scroll; giving more visual oomph to tempt readers to each story; experimenting (however meekly) in summarization for mobile; bringing in aggregation with a bit of voice. Much of the evolution of the Times’ apps over the past few years has been toward content parity — to ensure that every bit of content the Times produces was accessible in the native apps. (It’s easy to forget the iPad app once contained only an “Editor’s Choice” selection of articles.) That evolution was important from an infrastructural point of view and in elevating online content culturally within the organization. But it also meant the core apps ended up feeling a little overstuffed. But even if NYT Now isn’t the success the Times’ original paywall was, it should prove a valuable lesson in building for a mobile audience — which is, increasingly, just the audience. Here’s hoping that the DNA of NYT Now can spread back into the core apps and that it can push harder at bringing an experimental edge to sharing great Times content with the world. POSTED April 2, 2014, 7:58 a.m.
Benton, Joshua. "NYT Now, out today, mixes lots of good mobile-centric ideas with moments of caution." Nieman Journalism Lab. Nieman Foundation for Journalism at Harvard, 2 Apr. 2014. Web. 24 Apr. 2019. Benton, Joshua. "NYT Now, out today, mixes lots of good mobile-centric ideas with moments of caution." Nieman Journalism Lab. Last modified April 2, 2014. Accessed April 24, 2019. https://www.niemanlab.org/2014/04/nyt-now-out-today-mixes-lots-of-good-mobile-centric-ideas-with-moments-of-caution/.